Way to go!! I did this for a couple of months during Lent, and it was such an eye opener. What made you take a break? Oh, me too. Really glad I’m not the only one. Is that why you took a break from social media at Lent? Yes, and I realized it was taking energy that I could otherwise be pouring into my family. 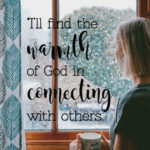 I know that God has given me a strong purpose as a mom, but when my nose is buried in social media, I can’t as clearly discern what that purpose is. You took the words right out of my mouth. That is what I am realizing too! I can scroll on my phone and see what all of these other moms are doing and what they feel their purposes are, and I can find myself almost watching them live out theirs instead of putting my phone down and living out the purpose God has given me…you know?? I can so relate. 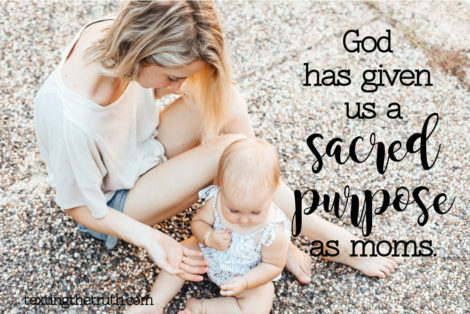 And while my purpose certainly isn’t the same as the next mom’s, God has given each of us a unique and sacred purpose to live out in this season. It may not appear Facebook worthy, but it is so valuable! What do you feel like your purpose is right here, right now? Undivided time and attention can feel like the hardest part of motherhood for me some days. God has also been challenging me to be more present with my boys, especially in this season leading up to adding a new baby. It seems so simple to put my phone down at the playground and chase them, but it speaks love LOUDLY to them. 💗 But it’s not easy, especially when I feel like my to-do list is a mile long. Yes, there seems to always be never-ending list of things to get done. It’s such a balance because I don’t think mothering with purpose means we have to engage 24/7 (or even disengage from social media). I think it’s totally OK some days to sit on the bench looking at your phone while your kids play. But what I am trying to focus on is to be a little more reflective in my motherhood. 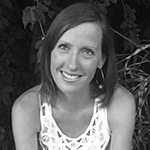 Hmm…so what are some ways reflection has given you direction in your purpose as a mom? When I take the time to listen to how God may be leading me throughout my day, I find that I’m much more able to be flexible when things don’t go like I planned. I can *respond instead of react* when things come up or when my girls may do something that catches me off guard (like when they paint in their brand new dresses and it stains!😖). Sometimes this also means realizing I need to put aside what I want to do and instead invest in my girls. That’s interesting you say that, because the other day I was sensing that my oldest needed some time at home with me, instead of going to school. Even though I was really looking forward to the down time, it ended up being the best thing for both of us. We were able to talk about big things he is feeling as he prepares for Kindergarten next year. I love that. And so for me, I feel like putting more limits on my phone time can only increase my connection time with my girls, so that I can be present in the ways I desire to be. I pray that is so! One idea that I heard about this year in MOPS was making a mom and family mission statement. Here is a good place to start. If you’re looking for your purpose as a mom, why not carve out time for one-on-one dates with your children? Those times will give you little glimpses into their hearts and ways to be present and connect with them. Consider having a designated time each day where your phone is turned off/put away. One of the moms in our community shared that she leaves her phone in the other room on purpose so that she is more present with her children. Okay! This is totally the truth and I so love this conversation. REALLY! And…my favorite part? 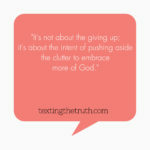 “We have to take the time to pause and listen to how God may be leading us as mothers. 💗” YES! and Amen!!! Oh my goodness, I loved and needed this. I could have written some of those texts! Being mommy means laying aside so much sometimes- my own tasks, my own ideas of how to spend my time etc. Been praying a lot for God’s wisdom about what to prioritize minute by minute. I know God has given me my son and I want to honor God in the littlest moments.